Don’t worry about your power bank out of juice, the AMPY portable charger is driven by your motion. If you like the novel design, let’s go on checking. The AMPY is an innovative, wearable portable charger that measures 2.5 x 2.5 x 0.75 inches and weights 140 grams. 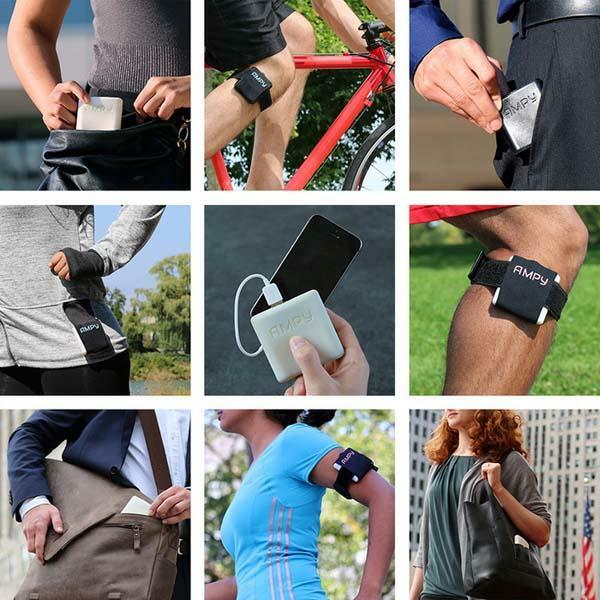 As we can see from the images, the wearable charger sports a low-profile and compact design, most importantly, the power bank is able to capture the energy from walking, running, cycling, and other human motions and charge your smartphone or other mobile devices using built-in 1000mAh backup battery, moreover, included sleeve, armband and clip allow you to easily wear the power bank on your arm, leg or other parts of your body for optimal energy capturing, and its custom app lets you check the mount of energy you’ve generated, the number of calories you’ve burned and your carbon footprint offset from charging with your AMPY. Apart from that, the portable charger can also be recharged via wall outlet. The team of the AMPY is raising fund via Kickstarter. You can pledge $95 to own the wearable charger with 3-piece accessory kit. If you like it, head to Kickstarter official site for more details or check out the following demo video first.